Who receives FREE RANGE TIME at On Target? A monthly gun club membership at the On Target Maryland shooting facility offers a variety of benefits for our high value and frequent customers. Our gun club membership grants free time on the shooting range. As a result, from a cost savings standpoint alone, a gun range membership makes perfect sense for those who utilize the shooting range at least twice a month. On Target gun club memberships also provide VIP access to the shooting range. In a scenario where the range is fully occupied, ahead of non-members who are waiting to shoot, On Target gun club members who call the shooting facility 30 minutes prior to their arrival gain priority access to the next available lane. 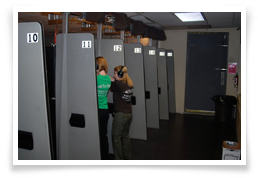 If other shooting range members are also waiting, members will gain access to a lane in an orderly fashion associated with the time of their original phone call.